Wounded Warrior Project® (WWP) is excited to announce an innovative social collaboration with the U.S. Department of Veterans Affairs’ (VA) Coaching Into Care program! This VA program provides resources and guidance to friends and loved ones of veterans so they can better inform warriors about getting the care they need. Using Facebook Live video, WWP and the VA’s Coaching Into Care team will engage warriors, their families, and caregivers in a virtual environment – giving them a unique opportunity to ask subject matter experts questions about some of today’s most pressing issues, such as barriers to care and how to utilize beneficial programs that will change the status quo. This event is one of the many ways WWP is breaking through organizational boundaries by working with industry leaders to ensure wounded warriors are receiving the quality care they deserve. 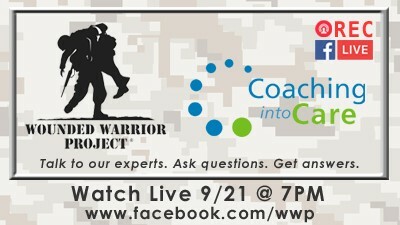 Check out the live video stream on our Facebook page Wednesday, Sept. 21 at 7pm ET to see WWP and the VA’s Coaching Into Care team huddle together. Show your support by liking and sharing our live feed.